This title helps you discover the best of classic and modern food from Ireland: the traditions, locations, ingredients and preparation techniques, with more than 400 photographs in total. 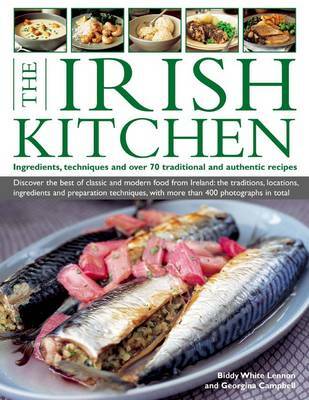 It provides the essence of Irish cuisine in a collection of over 70 fabulous recipes. It includes a comprehensive guide to Irish ingredients, featuring a full range of harvest fruits, fish and shellfish, meats and game and vegetables. It contains chapters that include Breakfasts, Soups and Appetizers, Fish and Shellfish, Meat, Poultry, Cakes and Desserts and Drinks. It provides authentic and traditional dishes to try that include Cheese and Guiness Fondue, Smoked Salmon with Warm Potato Cakes, Bacon Chops with Apple and Cider Sauce, and a comforting, classic Irish Stew. It contains over 400 colour photographs, easy-to-follow step-by-step instructions, informative cook's tips and variations throughout, plus a nutritional breakdown for every recipe. This beautifully photographed volume brings together the rich and varied ingredients, culinary customs and traditional recipes of Ireland. This collection of over 70 authentic step-by-step dishes that captures the delicious, home-cooked flavours of Irish cooking. The recipe sections features regional classics like roast loin of boar with poitin-soaked prunes, corned beef with dumplings and cabbage, fraughan mousse, and Gaelic coffee. There is a variety of traditional dishes including oatmeal pancakes with bacon, lamb and vegetable broth, Dublin lawyer, Irish stew, Michaelmas goose with apple stuffing, beef and Guinness casserole, apple pie and rich, fruity porter cake.